Painted in aged effect antique Craquelè white silver and adorned with ornate designs.Excellent masquerade mask for women. Sleek, elegant, and wonderfully unique, this Madam Macrame Luxury Venetian Masquerade Ball Mask is perfect for updating your mask collection with a style accessory that never fails to make a lasting impact. 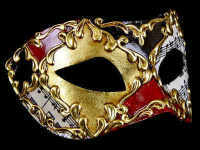 With its luxury appeal and eye-catching design, this beautifully crafted mask has been designed to complement and enhance your favourite party and evening ensembles, whatever your signature style. 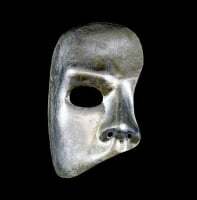 Featuring an endearing aged effect antique Craquelè white & silver finish and cool clear crystal design this exciting mask is sure to be a much-welcomed addition to your look. 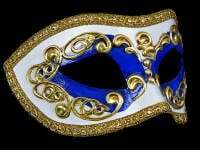 All masquerade masks are hand made and painted in Venice for women. No two are ever identical. Colours and patterns vary slightly on each mask & please remember these masks are aged so do not look in as new condition.